"I'll have my own Oktoberfest", I say to the ghosts of dead beers that float through my little house. "I'll have my own Oktoberfest", I say to the moths in my bank account. "I'll have my own Oktoberfest", I transmit psychically to the Aldi cashier as I pack my bag with bottles of Schwaben Brau beer. None of them hear me and I go home clanking and thirsty. As what seems like the rest of the world gears up to get turbo-mortal on German beer the Euro supermarket giant (terrifying if literal) Aldi has sorted this reporter out with a taste of Germany on a shoestring budget (£1.79 a bottle, and there are five Schwaben Brau beers on offer), and for the rest of this week you and the sinister bots that seem to hit my blog a lot are going to be reading about it, so pull up a stein and have a seat because it's about to get Teutonic in here. 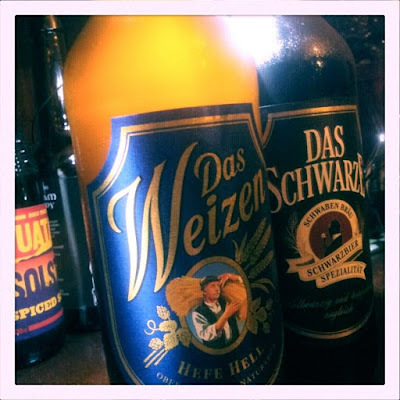 The first of our double bill tonight is Das Weizen, Schwaben Brau's wheat beer. With a light behind it it glows like the searchlights of aliens arriving on Earth to show us a bright and polished, war-free future, and this is probably a good metric of how thirsty I am. The swing-top pops open with a rowdy bang and the glass soon fills with hazy summer sunlight that exudes the bready, banana scent that a drinker can expect from a Weissbier such as this. The head, unruly at a hard pour, takes its time to concertina down to a bubbling centimetre of white foam. The first mouthful is a moment of bitterness followed by a numbingly sweet splash of lemon mixed with banana. Comfortingly refreshing, a soft soaking in uncomplicated fruits, with carbonation that is present but making little in the way of conversation. There isn't the instant neck-snapping wheat collision that a drinker gets from a glass of Franziskaner, the taste instead coming on like a softly rising tide. And with the gentle tide, the rapid undertow; the smooth, slender and easy-drinking nature of Das Weizen makes for a quick drink. Thinner on the mouthfeel than a lot of wheat beers on the market, it carries the drinker away and all too soon the glass is empty, slightly laced and begging to be filled again. There is a sour snap in the aftertaste once the final mouthful is done away with, fading soon as the palate prepares to be cleansed for a trip into darkness. 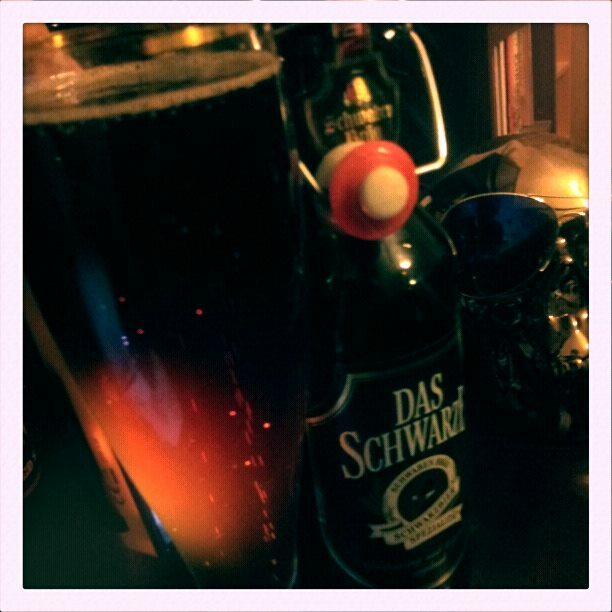 Another satisfying pop, and a little cloud of smoke, heralds the arrival of Das Schwarze, the brewery's Schwarzbier. From the neck, the scents of faint mint and resinous spices appear. 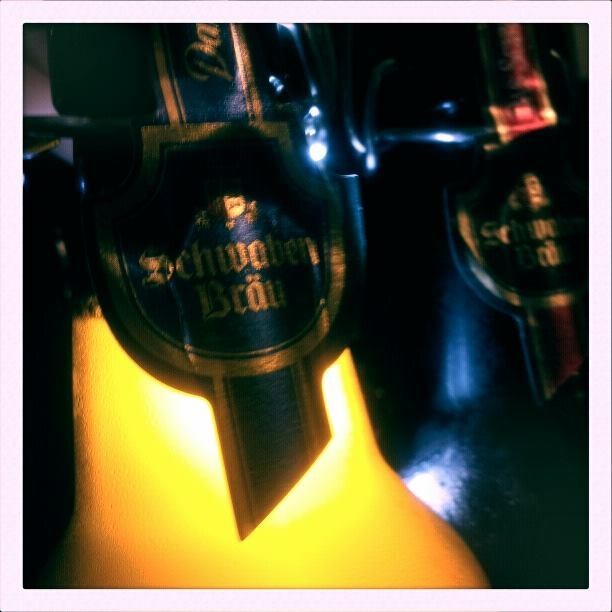 It pours dark, ruddy-blackish, and with light behind the glass the beer is almost oxblood in colour. The head, burly at first, dies down as I struggle to get a decent photograph of Das Schwarze because photographing dark beers is quite the task. There is little foam to bite through as I take the first mouthful, tasting malt, thin caramel, and dark forest fruits. Notes of raisin, slathered in sugar. are apparent. The ghost of Christmas Cake Past, flickering in and out of existence, floats and whispers somewhere near the bottom of the glass. The mouthfeel is thin, like the Weizen before it. So far, so good. 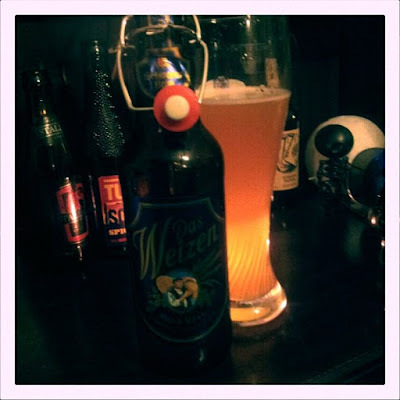 Das Weizen is a refreshing-in-spades Weissbier that is easily sessionable. Although I wasn't aware of wheat beers at the time something about its taste takes me back to being "funemployed" at 19 years old, drinking beers in the bright clean sunlight and listening to Glenn Danzig sing about a Dirty Black Summer, while having no clue about what I was going to do with my life. Das Schwarze is tough and brooding at first glance, but (much like Glenn Danzig) doesn't really pack a punch and goes down easily once confronted. Boy, that paragraph came together alright in the end, didn't it? Stay tuned for my takes on Schwaben Brau's Volkfestbier, their Naturtrube (an unfiltered Pilsner) and their pale lager Das Helles, every night this week.